Automatically dries the wood by controlling the temperature and the pressure inside the cell in relation to the type of wood, its thickness and moisture content. 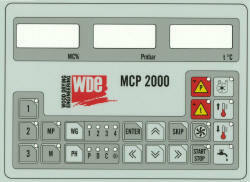 Has 40 programs in memory of which 30 are already set by the manufacturer and 10 that can be modified by the end user. Can be connected to any external computer up to 500 metres away so that the end user, from his office, can monitor the drying process, modify machine programs and operation and print drying graphs and tables. A single external computer can be connected up to 16 drying cells that are each equipped with a microprocessor.